When it comes to high-impact policy barriers, the greatest level of agreement among interviewees was about the failure to get a renewable portfolio standard implemented. This is perceived to be compounded by the regulatory ban on third-party providers, who are barred from entering in power purchase agreements with residential and commercial customers. Further, the absence of virtual net metering as a cornerstone of community-owned solar and the fact that shared solar is compensated only at the avoided-cost rate are cited as first-rate impediments to more distributed solar. 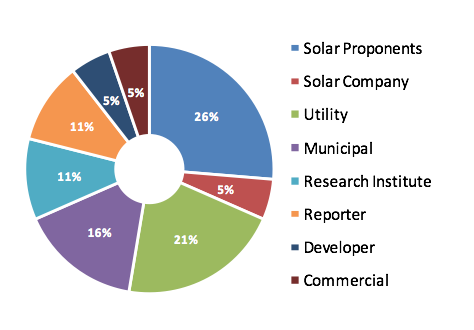 Utility-scale solar, which according to utilities themselves, is cost competitive in certain regions is said to be held back foremost by the multifaceted market insulation of utilities as well as the regulatory failure to mandate that utilities consider non-fossil fuel generation alternatives in their resource planning. 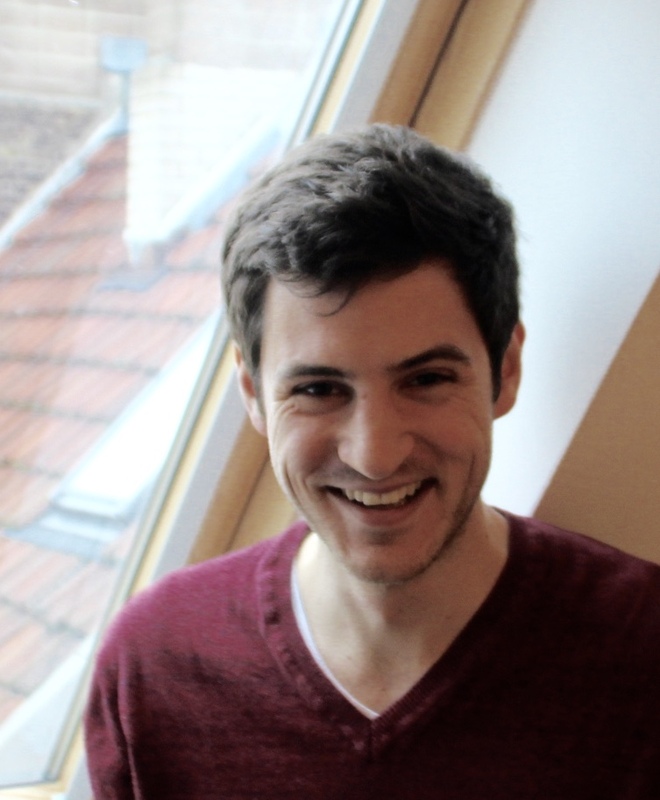 With the exception of utility representatives and affiliated groups, there was consensus that the political and regulatory capture by fossil fuel interests lies at the core of these disincentives. Campaign-sponsoring and donations to both political parties maintain a dependency between the majority of legislators, who select the industry’s regulators. In absence of support for low-to-middle income households, the difficulties to monetize the 30% federal solar tax credit restricts the income segments for whom investments in solar systems pay off quickly. Mirroring great regional differences in Florida, in terms of renewable energy support and adoption, some counties and cities have backed proven financing models and partnered with solar cooperatives to reduce the upfront cost of solar. 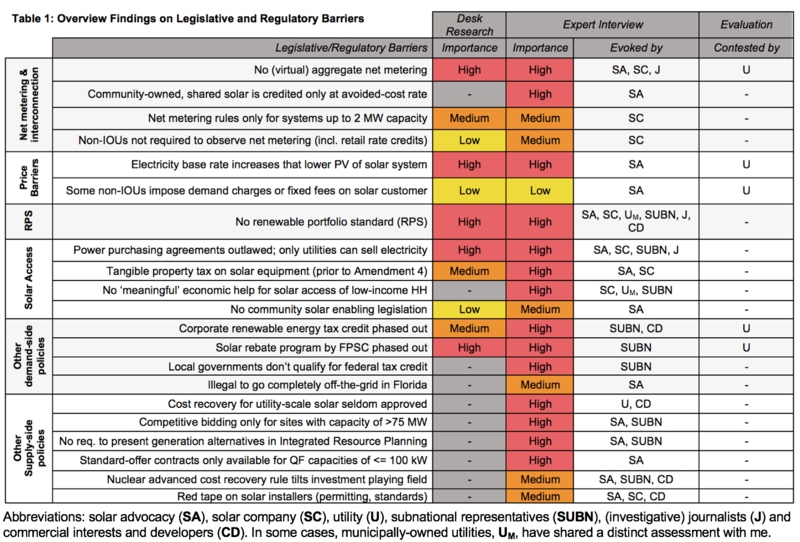 Even as Florida can legitimately be called a solar laggard at this point in time, there is ample space for sub-state actors to further reduce soft costs of solar and build on early successes in policy coordination on lower levels of government. Check in next week for Part 2, which will look in more depth at the individual policy barriers and reasons for their existence. Also be sure to catch up on an earlier post, where I introduced a fully interactive map of Florida’s behind the meter solar capacity county and utility from 2005 onwards.